This site contains links to commentaries I have written about Anti-Semitism, Jewish Observance, Jewish Life In America, Israel and the World, Israel and the Press and Terrorism. Most of them have first appeared on other web sites . It is my sincere hope that they make you think and make you act. The Health Crisis Caused by Arafat's Death: Whacko News Syndrome: The Father of modern terrorism is dead and the media is tripping over themselves to make him a hero. Is it bias or are they just suffering from Whacko News Syndrome? What Kind Of World Will My Children Grow Up In? .....its time to throw away the political correctness and realize the Muslim world doesn’t just want Israel out of the west bank ad Gaza ---they want us Dead ! Ruling the World: The Untold Story... maybe we should fess up and tell the world the truth, the Jews do run the world. Who Wants to Be an Anti Semite: I was privileged to get a glimpse of the first episode of a new reality TV Show. WAKE UP and Smell The Anti-Semitism: Virulent anti-Semitic campaigns are underway -- not only in the Middle East, but in Europe and America, too. The DaVinsky Code...Almost 2000 years ago, a clandestine society was formed in what is now Iran. Since it was created, the group, called Opus Vey, has operated as a kind of shadow Sanhedrin, debating and creating revisions to Jewish law. Today the group still exists, run by direct descendants of the founders who set up the Society. Walking to Shul With My Dad: I was a three-day a year Jew who stopped by McDonalds on the way to the golf course every Saturday morning. Now I'm being called an observant Jew. What happened? Terrorism is NOT A Crime ! : Confessions of a one issue Voter Perhaps my most vivid of personal memories of 9/11 came over the car radio. 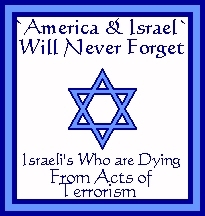 Tuned in to my usual fare WFAN a sports radio station, I listened in shock as two afternoon sports hosts, Mike Francesca and Chris Russo blamed the tragedy on the United States' support of Israel. They went even further suggesting that Jews in the U.S. needed to take a loyalty oath to decide between America and Israel......In just a few short months, we will be casting our votes for president and as that date approaches, it becomes increasingly clear that it is wrong for Jews to separate their love of Israel from their selection of the next leader of the free world. The Gift of ADHD: ADHD has taught my daughter that nothing comes without working very hard and that you don’t take good friends for granted. It has taught my wife and me that too many educators just don't get it. Drugs--A Jewish Problem: When a Jewish family needs help with drug abuse, where can they turn? Daddy on The Unemployment Line: All of my life I have known exactly what I want to do next. Being laid off has left me confused and dazed. (This Article is featured in Aish.com's book Heaven on Earth.. Click here to buy it now! The Myth Of Visable Diversity: It's time to start wearing our Jewishness on our sleeve. Saying Shehecayanu: The promise of Oslo on September 13,1993 was never fulfilled. Will the hopes of September 13, 2003 be realized? Is Kofi Annan Missing? : Sometimes my wife make fun of me, she says that I am such a worrier. Usually my concern surrounds my kids, family or a close friend or my job never a public figure. Lately my worry is causing me to lose sleep and it's not even someone I know personally. I am very concerned about Kofi Annan, the Secretary General of the United Nations. My High Holiday Prayers: We should be asking G-d to soften the hearts of the people whose hands are stained with the blood of terrorism... organizations such as the UN and the E.U., groups such as the NY Times and the BBC. The Health Crisis Caused by Arafat's Death: Whacko News Syndrome: The Father of modern terrorism is dead and the media is tripping over themselves to make him a hero. Is it bias ? or are they just suffering Whacko News Syndrome? Tom Friedman: Protector of His People: My Friend Phil Says that Tom Friedman NY Times columnist may have gone off the deep edge. He doesn't realize that good old Tommy may be a hero. Don't Blame the Press: The press isn't trying to be biased against Israel, they are just trying to save a little money in a difficult economy. I'm Switching From Fox News To Nickelodeon....no more news. Gilligan's Island reruns on TV Land, maybe, but news no. I can't take it anymore. The more I watch, the more I upset I get. Prophet School sometimes a public figure make as statement that seems so very absurd, so way out there that it makes you wonder if maybe it is true. Such was the case last week when Yasser Arafat stood in front of the Palestinian legislative council and admitted that he has been a bad boy, using as his excuse, "even Prophets make mistakes" Does Arafat really believe he is a messenger of G-d. And if he is...where did he go to prophet school. Making Better Prisoners It finally happened ! Usually, I assume that the press coverage of Israelis going to be biased and unfair. Sometimes during my morning, commute into the city I begin to display knee-jerk reaction, angrily muttering to myself , just from reading headlines. But no more! Today an important lesson was learned. There ARE cases where the press can be right about its Middle-East coverage. Yasser Peacenik....Fox got the idea for Joe Millionaire from a long running European show, a program that is also based on the premise that someone is not who they appear to be -- it's called Yasser Peacenik. Its Time To Get Angry: I am angry with myself and with other Jews in the Diaspora for not being angry enough. Thanks to HASHEM for giving me the inspiration to write.